Each year there are a variety of photography events around the world, from trade shows to contests to coordinated gallery openings. Some may be out of your reach, but many take only minutes to join in on. What I’m really looking at, though, are events that are a bit more ephemeral — mostly taking place online, or in simultaneous groups in a variety of locations. Events you can participate in simply by deciding to join the fun. I’m not including trade shows, photo contests or anything that isn’t open to all and more-or-less free. In addition, there are likely a whole lot of regional events you can participate in or visit in your area. Denver, for example, hosts the Month of Photography every other March-April, which encompasses exhibitions, lectures, portfolio reviews and more. The Dallas Photo Walk meets several times a year, including a photo walk at the State Fair of Texas (thanks for the heads up, Mr. Holga). UPDATED Nov. 4, 2015: Turns out I left one event out, and there’s another new one starting up. The list has been updated! Roll in a Day is a fun project you can do any time. A single day used to be set in advance for each month, but a recent rule change allows you to pick the day of the month (and you can participate any month you choose). You can use any equipment, but you have to shoot a whole roll of film (there are some guidelines for different formats, including sheet film, in the group rules) and share them all — no matter how bad or accidental! Share them by creating an appropriately titled (like RAD2015monthday) Flickr album and adding the right tags. You can add a few photos to the group pool on the official Roll in a Day Flickr group, too. Not a lot of Twitter activity around Roll in a Day, but it’s a really fun exercise; I have participated several times in the past. For the Celebration component, you can share up to three 120 images to the 120 Love Day Flickr group between January 13 and January 20. Ten images will be selected and shared on the 120 Love website and Facebook page. The Competition works a little differently. You shoot a whole roll of 120 and make a contact sheet of the entire roll (even the bloopers! ), and then select a single image. Submit the image and contact sheet (optically printed or flatbed scanned) with relevant details for a chance to win some cool prizes from 120 Love and Lomography. Submissions for the competition open on Nov. 20, 2015! Read the complete guidelines and check out the prizes at the official 120 Love Day page or connect with @120LoveFilm on Twitter and start planning your roll! Believe in Redscale is a month-long celebration of redscale photography — shooting with your film backwards. Conceived of and sponsored by BelieveinFilm.com, it’s primarily a Twitter, Instagram and Tumblr hashtag event. Check with @filmdevelop on Twitter to prod him into posting the details for 2016. Last year’s hashtag was #bifscale15. Here’s the post promoting the event for 2015. You may or may not remember, but I participated as best I could this year, going through four or five rolls of film I respooled backwards by hand and getting some interesting results. Check out my posts: Redscale Part 1, Redscale Part 2, and Redscale Part 3. The Ides of March — that’s March 15, if you failed literature in high school — was chosen to add color to a time of the year with less film-related photo events, and because it’s the day that Julius Caesar notoriously … expired. Expired Film Day celebrates the joys of using film whose Use-By date has (preferably long-since) passed. One of the particular pleasures of being a film-using photographer in these modern times is the abundance of expired-but-still-probably-pretty-good film on the market, found in grandparents’ attics or at thrift stores, or sourced from the freezers of pros who’ve gone digital. There is a huge expired film giveaway prior to the event, and a competition for spiffy prizes from a variety of sponsors. 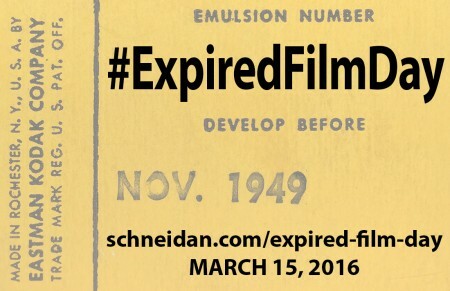 Just be sure to shoot your expired film on March 15; you’ve got a month afterward to process and scan it, then submit it for awesome awards. This month-long, theme-based project hopes to spark creativity with daily theme suggestions. No limits on cameras or film types. You can find each year’s themes, and submit one photo per theme, at the official site at marchoffilm.com. Worthwhile notes: It does not appear that any 2015 themes were ever posted, so this project may have run its course. Additionally, by submitting you are surrendering some rights to allow them publish your photographs, so be sure you read the disclaimers before submitting anything. This one doesn’t explicitly exclude digital, but come on — who ever heard of a digital pinhole? Yeah, okay — but keep it under your hat. Pinholes deserve film or photographic paper. The only requirement is that your submission be made without the aid of a lens — aperture only. The Flickr group appears to be basically defunct, but there is some activity on Facebook and on the Twitter hashtag #WorldPinholeDay. Photos can be submitted and more details can be found at pinholeday.com. Worthwhile notes: There are some permissions surrendered by submitting; be sure to read all the rules. Polaroid Week celebrates all things instant. Join up with your Polaroid, Instax or any other instant camera and film. 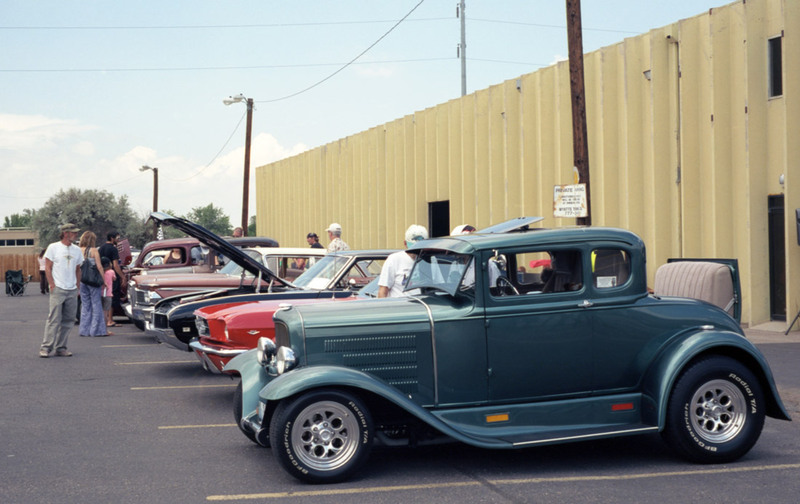 You can submit your photos to the official ‘Roid Week Flickr group (new groups each year). Dates and more details can be found on the Flickr page, as well. Follow @PolaroidWeek or @ShellySometimes on Twitter, or check out the hashtags #polaroidweek and #roidweek. No camera or film requirements for this one — just bring your film camera and have a blast. Lomography celebrates with events at their stores around the world, but you can certainly tag your film photos #FilmPhotographyDay that day no matter where you are. Lomography usually highlights some inspirational ideas for the holiday each year, but be warned — they are still hoping to sell you something, too. Watch for next year’s dates and more details on lomography.com. May 1st was celebrated as “International Day of Worker’s Solidarity” in the former Soviet Union, and now film photographers can celebrate it by making pictures with their “Commie Cameras.” Any camera of Soviet origin is acceptable, so break out those Kievs, Zorkis and Zenits, and yes, even the stout FED-5c. No real Twitter activity on this one, but you can always find this year’s Flickr group and submit some photos for your komrades! Also note: Check out Alex Luyckx’s Classic Camera Revival podcast for a fun episode discussing the photographic red scare as Soviet cameras poured into the world after the Berlin Wall fell. IKFPD is a worldwide celebration of George Eastman’s birthday every July 12. The man invented roll film, people — he deserves a little recognition! You can use any camera, film, developer, paper, whatever — the only caveat being that at least some of your process has to involve a Kodak product. I gave it a go in 2014, using Kodak Ektar 100 in my mid-60s Kodak Retina Reflex IV, and Kodak Tri-X in my Nikon F2. Someday I’ll post more photos, but a couple of them grace this post. Find more details and add your photos to the pool (be sure to tag the Kodak products you use and follow the captioning guidelines) on the official IKFPD Flickr group. There is very little other social media activity around IKFPD. 127 Day celebrates the smaller medium format — 127 film. I got back into film in time to have tried some out (Baby Brownie Special, Mar-Crest toy camera, Imperial Satellite), and it’s a very cool format. Sadly, 127 has been pretty much discontinued. It still can be had from Blue Moon and Maco Direct (German), although it’s not cheap. Given the multitude of 127 cameras made in the 1950s-60s, particularly from Kodak and Imperial, you shouldn’t have any trouble finding one. If you get a Kodak camera, you can combine this with IKFPD! Holga Week is seven straight days of heavy vignetting and stunning light leaks. To join, all you need is a Holga camera — any of the many models will do! I participated this year and am almost done preparing the resultant photos for publication, so prepare yourselves for a post. You can submit your photos for a chance to win prizes, or just add them to the official Holga Week Flickr group. Next year’s dates and more details can be found at holgaweek.com. Follow on Twitter with the hashtag #holgaweek. Argus Day takes place one day later in August each year, the day serving as a sort of volume number (since the first event was on Aug. 1, 2001). In 2016, for example, Argus Day will be August Argust 16th. The holiday celebrates the venerable and American-made Argus cameras that dominated the budget-conscious middle class from the 1940s to the mid 1960s, and is sponsored by The Argus Collector’s Group. Grab your Argus camera and make pictures! I missed it again this year, but I’m prepared for next year with the Argus Match-Matic C3 and an Argus Seventy-Five TLR. You can submit photos to the Argus Collector’s Group and find plenty more details on their site at arguscg.com/events/argusday. They also have an active Flickr group. While this holiday is celebrated by plenty of digital photographers each year, Aug. 22 is Henri Cartier-Bresson’s birthday. Street Photography Day honors the master (and father) of modern street photography and photojournalism each year with a day of documentary photography. Equipment isn’t particularly important, though we all know Cartier-Bresson was in love with his Leicas (he and Robert Capa are probably mostly to blame for “red dot fever,” though the list goes on). What concerned Cartier-Bresson was the decisive moment, and getting it right in the camera — not what camera you used. It’s doubtful that Cartier-Bresson ever used a digital camera as he all but quit photography in the 1970s. He died in 2004, before digital photography eclipsed film (in late 2006). Street photography is very popular among film photographers, though, and it makes sense to honor its old guard on HCB’s birthday by using film. There doesn’t seem to be a central place for information about Street Photography Day, but The Online Photographer is a regular participant. Okay, this isn’t necessarily a day to break out your camera. The idea behind Film Buying Day is to save up your nickels and dimes and inundate the photographic industry with a giant sales day, worldwide, every Oct. 1. By splurging on tons of film that day, the thinking goes, the purchasing spike may help to encourage suppliers to continue offering photographic film that much longer. In the past, some photography suppliers have offered specials on Oct. 1 in honor of Film Buying Day. The IFBD Flickr group hasn’t seen much activity for a few years, but a peek at the Twitter hashtag #FilmBuyingDay shows the spirit is alive and well. More details can be found at filmbuyingday.blogspot.com. So grab your cheapest plastic camera (a Plastic Filmtastic Debonair, perhaps?) and get to shooting. Dates and details can be found at WTCD.org, and though updates have been spotty the last couple years, the event still definitely has a following on Twitter ( hashtag #WorldToyCameraDay) and in the WTCD Flickr group. Just like in spring, Fall Polaroid Week celebrates instant photography. Use a Polaroid, Instax or any other instant camera and film. Submit your photos to the official ‘Roid Week Flickr group (might be a different group for fall — there was in 2014). Next year’s dates and more details can be found on the Flickr page, as well. Follow @PolaroidWeek or @ShellySometimes on Twitter, or check out the hashtags #polaroidweek and #roidweek. So, 2015 is the first year of this event, but it promises to be a good one. Again, less about actually making pictures on a certain day — instead, you’ll trade film, cameras and accessories with other film photographers. @Emulsivefilm‘s site came on scene early in the year and has made a big splash in a short time. Quite a few well-known members of the #believeinfilm community will be participating, as well as some mysterious film vendors. It works like a traditional Secret Santa swap, but be sure to check the post on emulsive.org for full details. P.S. : If you sign up this year, there’s a chance I’ll draw your name — and I’m planning what I hope is a pretty sweet little surprise! So here’s a list of honorable mentions — these annual events are mostly digital, because the world is mostly digital. That doesn’t mean you can’t participate, although some may be particularly difficult given the slower turnaround time of film. This list is by no means exhaustive, just some highlights I’m familiar with or that were suggested to me. Each is listed with its 2015 date if the date fluctuates, but future dates and other relevant information should be available at linked sites. As you can see, there are plenty of photography events to participate in every year, although February and November are notably devoid of things to do. And this list may not be complete — I need your help! Let me know what I’ve forgotten in the comments. And mark up your calendars!